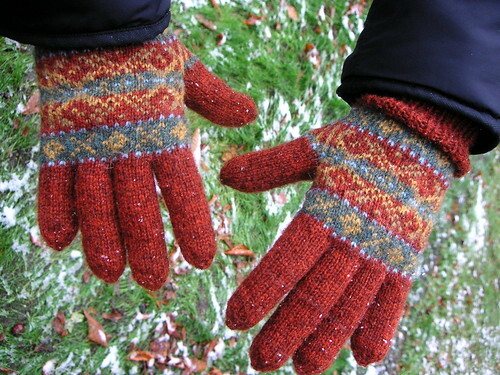 my autumn forest gloves are finished! this is the second pair of gloves i’ve knitted from “knitting fair isle mittens & gloves” and i will definitely knit more. right now i have plans for a pair of mittens. the instructions are fairly easy to follow, but i would say that basic knitting skills and ability to adjust the pattern to fit is required. i added two stitches to the main pattern (chart a) and one stitch to chart b which is necessary if you want chart c to come out right. it might sound a bit complicated, but if you look at the pattern it becomes obvious. the pattern in the book is the same for all gloves, you only adjust the number of stitches to fit the charts. i also added a thumb gusset based on a mix of the different gussets available with some of the other patterns. Wow, they are really beautiful! My name is Daniela, I’m 24 and I live in Italy, near Milan. Actually I spend a year in Sweden for Erasmus project and I’m studing at Hogskolan Dalarna in Falun, where I live. I found your blog when I searched about knitting in Falun… wow, your works are super!!!! I’m not so good in knitting, I can only made scarfs! ahahah But I really love it, and also cross-stitch! I will read your blog also in future! Otroligt vackra vantar! jättefina färger tillsammans. Katarina, those are beautiful! The colors are so amazing. Wear them in good health! Katarina, what a fantastic pair of gloves you made! I am certain, they will kill the winter chills! ENJOY! Jag imponeras av människor som kan sticka BÅDE flertrådigt o fingervantar! Själv kör jag med tumvantar, men broderar gärna nåt efteråt eller stickar flätmönster. Beautiful mittens just in time for the great snowfall in Stockholm! Beautiful! 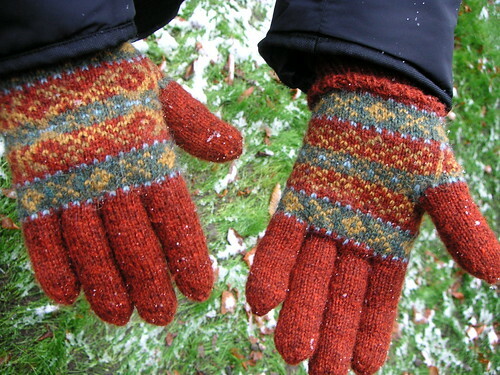 I love gloves, I just have a bit of a mental block with knitting the fingers… so fiddly. Have to make a pair, though, they are so nice. The gloves are beautiful, I love the colors! Wow! They are SO Lovely! I’m sure they’ll brighten up winter days. Your gloves are beautiful! I really like the red tweedy yarn. They’ll keep you nice and toasty. Kul att få se dem färdiga. Såå snygga! Tack för senast. Ser fram emot tisdagskvällarna på Hurtigs Konditori. Har börjat leka med min nya mobilblogg. Se “websiten” ovan, men jag har låångt kvar och mallen som används är inte särskilt rolig. Wow, they are so beautiful! Love the colours, very warm! Wow, they are so beautiful! Now it’s just to wait and hope for a white winter to show them off!! your gloves are so beautiful! I love them! I’m so going to get this book! I’m so smitten with mittens. I tried these, didn’t come out. I’ll try your adjustments. Oh, that’s too bad! I hope you’ll be able to tweak them! They are lovely!! Are you making them for people to buy? Thank you! No, sorry I don’t.